A GIRL SEARCHES for her lost grandmother while her parents quarrel at home; a young architect finds herself entangled by a strange commission; a man contemplates inertia after toxic fallout changes life in a remote Australian town; a woman imagines a mother’s love for her autistic son. The award-winning stories in The Rest is Weight reflect Jennifer Mills’ years in Central Australia, as well as her travels to Mexico, Russia and China. Sometimes dreamy and hypnotic, sometimes dark, comic and wry, Mills weaves themes of longing, alienation, delusion, resilience, and love. 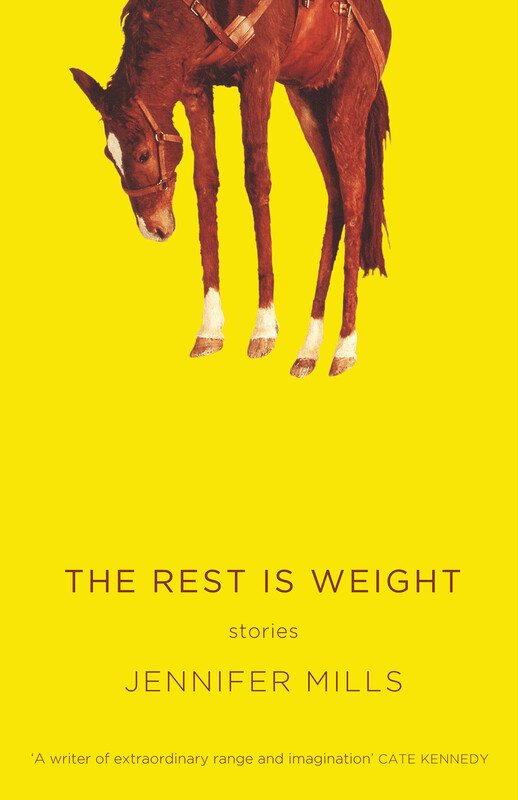 Collected or on their own, these stories are both a joy and a wonder to read. “By shifting, in subtle ways, the ground beneath our feet, Mills also allows our certainties about what is concrete and tangible – about the world in which we believe we’re living – to fall away, and we find ourselves immersed in spaces that are – disconcertingly – both recognisable and inexplicable. “It’s immediately clear that we’re in the hands of a professional writer, a craftsperson who cares deeply for language and for her characters.